The 100% grassfed organic beef, pork, and poultry from Mark & Lynne Faille’s Simply’ Grazin’ has drawn loyal customers to their Hillsborough farm for years now. And some of it is carried by Whole Foods markets up and down the Eastern Seaboard. So why did the Failles feel the need to open Mallery’s, their brick-and-mortar market just up the road in Skillman? And why did about 1,000 people show up on opening day? I tell all in the August 22nd issue of US 1. 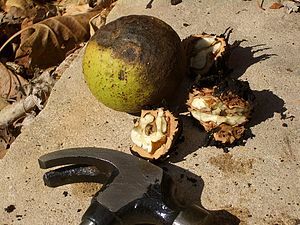 My favorite ice cream flavor growing up was black walnut. Looking back that seems like a pretty sophisticated choice, since the Eastern Black Walnut (Juglans nigra, to biologists) has a particularly robust, rich, earthy flavor and, to my mind at least, an attractive fermented quality. You don’t come across black walnuts much these days. They somehow became old-fashioned, losing ground to the more common English walnut. By rights they should be a darling of the current craze for foraging because the American Black Walnut is a 100% natural, wild, sustainable crop that grows naturally in the woods, pastures, and yards of the Midwest. It is virtually unchanged since the days it was a staple of the Native American diet. Each October when the nuts naturally fall to the ground, local residents collect the nuts and sell them to hulling stations, like those of the Hammons Company of Stockton, Missouri, now in its fourth generation. You can imagine my delight when while trolling the aisles at this summer’s Fancy Food Show I came across Hammons, a.k.a. “the black walnut people.” When I asked what stores in New Jersey carry their bags of raw, chopped nuts, they mentioned Wegmans. Alas, only their stores south of Princeton carry them. Undaunted, I ordered two bags of Hammons chopped raw nuts over the company website, and began experimenting. By the way: black walnut trees grow in New Jersey, too. In fact, the one in my neighbor’s yard when I lived in Hightstown branched over into mine. But Miss Embly, my elderly neighbor, warned me that trying to crack the shells was almost impossible and would result in my hands being stained black. Which is why Midwest foragers take them to Hammons, where the nuts are run between large steel wheels to crack the hard outer shells. I have to admit that straight out of the bag, raw black walnuts don’t taste very good. Once they meet heat, though, it’s another story. Ice cream and baking are traditionally where the black walnut shines, as it does in the buttery cookie recipe below. It’s from my favorite baking book: I have probably reprinted more recipes from Jim Fobel’s excellent tome than any other over the years. Here are even more reasons to embrace the American black walnut tree (figuratively speaking, of course). Black walnut shells are eco-friendly, inert, nontoxic, and biodegradable, which is why they’re used in the industrial blasting industry to clean brick, metal, and wood, especially in historic preservation projects. The oil industry uses the shells as a filtration media. And in a completely different sphere: black walnut wood is among those used to make wands in the Harry Potter series. (American black walnuts were transplanted to Europe in the 1600s.) A wizard with such a wand should have “good instincts and powerful insight.” I submit that home cooks with good instincts and powerful insight might want to give black walnuts a try. 1. Position two racks so that they are evenly spaced in the oven and preheat to 375 degrees. Grease two baking sheets. 2. In a medium bowl combine the butter and sugar. 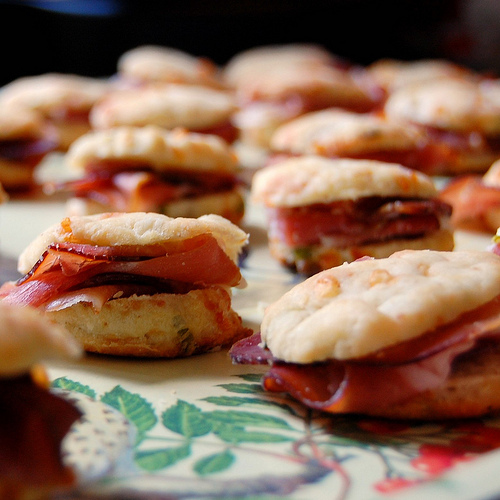 With a handheld electric mixer, beat until fluffy, 1 to 2 minutes. Beat in the egg until blended. With a spoon, stir in the black walnuts and vanilla. 3. On a sheet of waxed paper stir together the flour, baking soda, and salt. Stir half of the dry ingredients into the butter mixture and then stir in half of the milk. Stir in half of the remaining dry ingredients and then the remaining milk. Stir in the remaining dry ingredients to make a sticky dough. 4. Using 1 level tablespoon of the dough for each cookie, drop it onto the prepared sheets, leaving 2-1/2 to 3 inches between them (1 dozen per baking sheet). Bake until golden brown, 8 to 10 minutes. Transfer with a spatula to racks to cool. Repeat with remaining dough. While I was in DC this past weekend for the Fancy Food Show (more on that in a later post) I dined at Little Serow, the newest restaurant from Johnny Monis. I have been a fan of this Beard-nominated chef since the early days of Komi, his modern Greek restaurant. A Thai place – and one focusing on the cooking of the Isaan region in the north, near Laos – was the last thing I expected of this Greek-American chef. But he pulls it off – with typical quirkiness and (as far as I can tell) authenticity. Both the quirks and the cuisine warrant a few cautions. Little Serow (which, as the website explains, rhymes with arrow and is a kind of goat) accepts no reservations for its 28 stools in a dim, bare-bones but cool space that features brick walls painted sea green and a rippled metal ceiling. There’s no phone. Parties larger than four are not allowed. Diners line up outside the basement space (next door to Komi, in Dupont Circle East) and wait for seats to open up. The restaurant will text you when they become available, so going for a drink nearby makes this a non-issue. Little Serow serves a seven-course dinner of small shared plates, for $45. The menu changes weekly; no substitutions are allowed. If you have allergies, forget about it. Don’t like fresh cilantro? You’ll encounter it often. Can’t tolerate spicy chile heat? You are hereby warned. As for myself, I love cilantro but have my limits on firepower. The food here did not exceed them, and the abundant fresh chilies add such depth of flavor, such soulful resonance, it’s impossible to imagine the dishes without them. First to arrive was a basket of light, airy, crisp, grease-free but immensely flavorful pork rinds with an addictive dipping condiment (naam phrik ong) of minced pork, shrimp paste, and tomato. Paired with this was a cocktail from a section of the wine and beer list labeled “wine on ice.” Ours was a combination of Riesling with house-made Armagnac (I could have sworn our personable and informative server said Carmagnac, but that doesn’t seem to exist), plus a good dose of coriander, which gave it a pleasing herbal quality, and cinnamon (not enough to be noticeable). 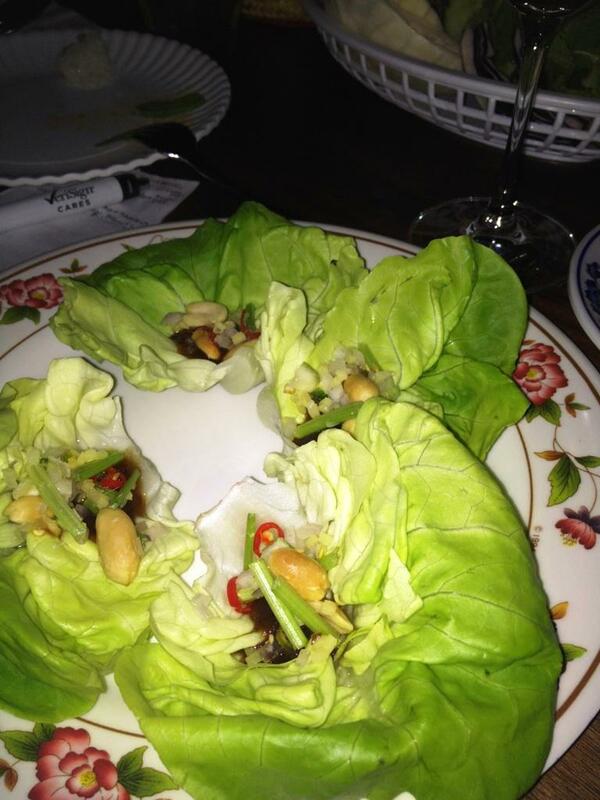 Next came these irresistible lettuce cups (miang kham), each with a dollop of a mixture of dried shrimp, fermented cabbage, tamarind, ginger, chilies, and peanuts in light dressing the flavor of which conjured hoisin sauce. A dry Riesling was the perfect accompaniment. 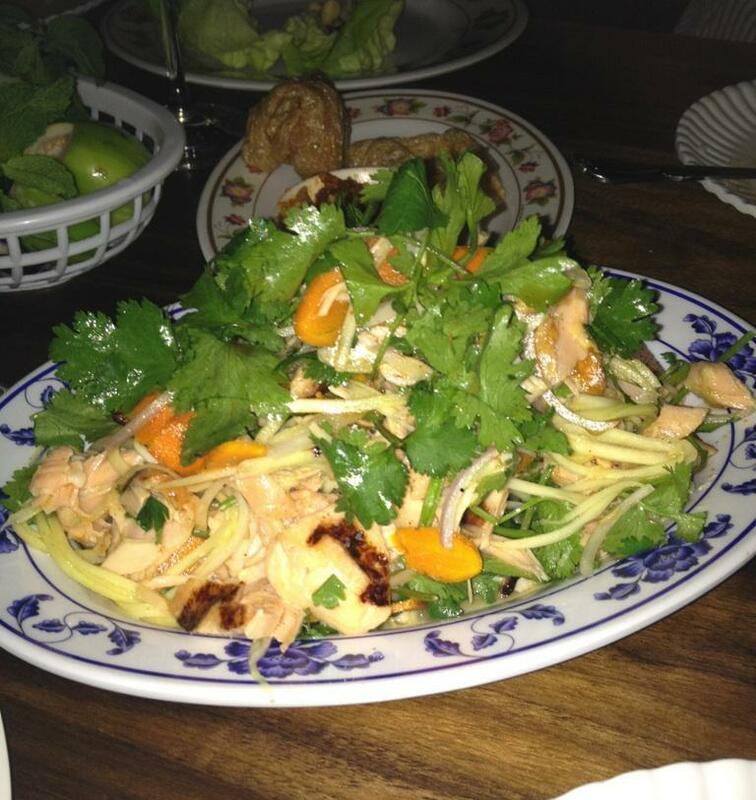 Below is a lush, spicy salad of king salmon (yum bla mamuang), featuring slabs of moist, silky, flavorful fish with green mango, fresh turmeric, and lots of cilantro. Next up was a dish of wonderfully crispy shredded ingredients (laap meuang) – pork, shallots, and fresh green sawtooth (an herb sometimes called culantro), and this and the following dish went beautifully with our first beer, a hoppy but not overly hoppy IPA. The next, fifth, dish was perhaps my favorite: a mound of chunks of what the menu called crispy rice (khad tod) – and was probably chunks of crisp-cooked sticky rice but tasted for all the world like rice cakes coated with a tasty spicy sauce and tossed with tons of fresh mint sprigs, cilantro, and peanuts. With it: a sweet Riesling – like, dessert-sweet – that played off beautifully against the formidable heat. Next came a supposedly less fire-filled mix of greens (yum phak), including fava leaves (! ), and spring pea pods tossed in a tamarind sauce with crunchy shallots on top. 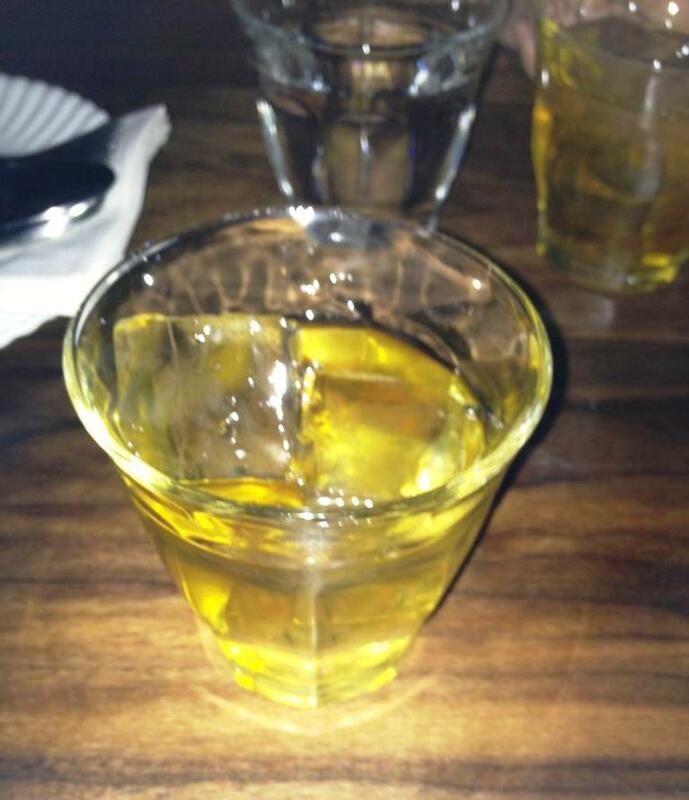 Here was the only drink none of the four of us in my party liked: a French hard cider – usually a favorite! – but really funky. My group’s tasting notes include “Band-aids” and “sports body spray.” Oh dear. 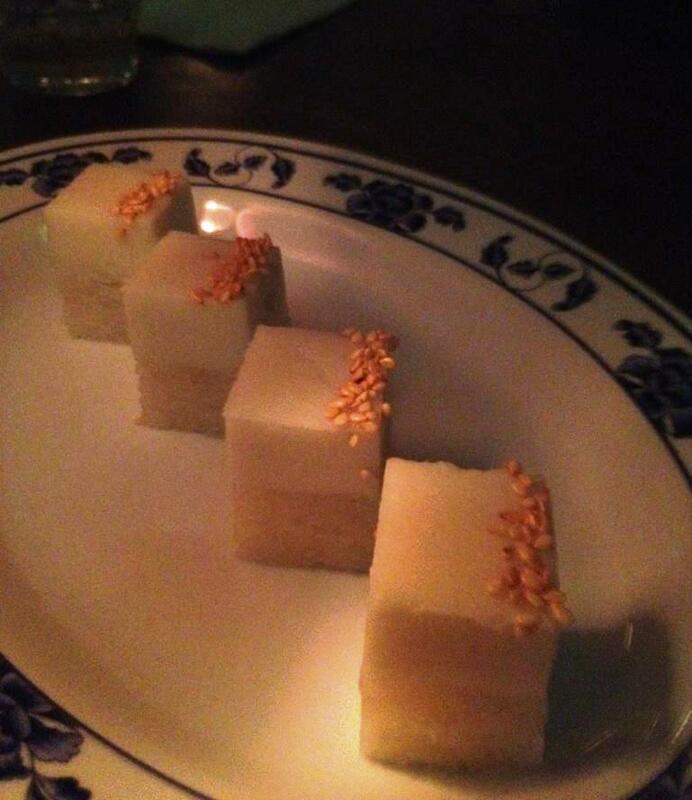 Dessert is not listed on the menu, but we got these not-too-sweet cubes, with a bottom layer of creamy sticky rice and a top layer of the smoothest coconut custard ever. For a dining experience closer to home, check out my review of Osteria Morini, the Bernardsville outpost of Michael White’s famed SoHo eatery. (The print version appears in the July issue of New Jersey Monthly.) 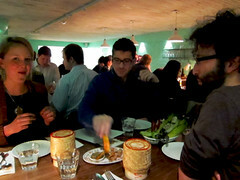 Osteria Morini took over the space that had been Due Terre – another property of White’s Altamarea Group. Among the veterans producing White’s signature takes on rustic Italian fare at Osteria Morini are Bill Dorrler (formerly at Due Mari in New Brunswick, another White property), Kevin Knevals (chef de cuisine here), and Francois Rousseau (one of the managers, also from Due Mari). Now that I have you hankering to dine out…..
It’s just about time for the first NJ-based Eat Drink Local Week! 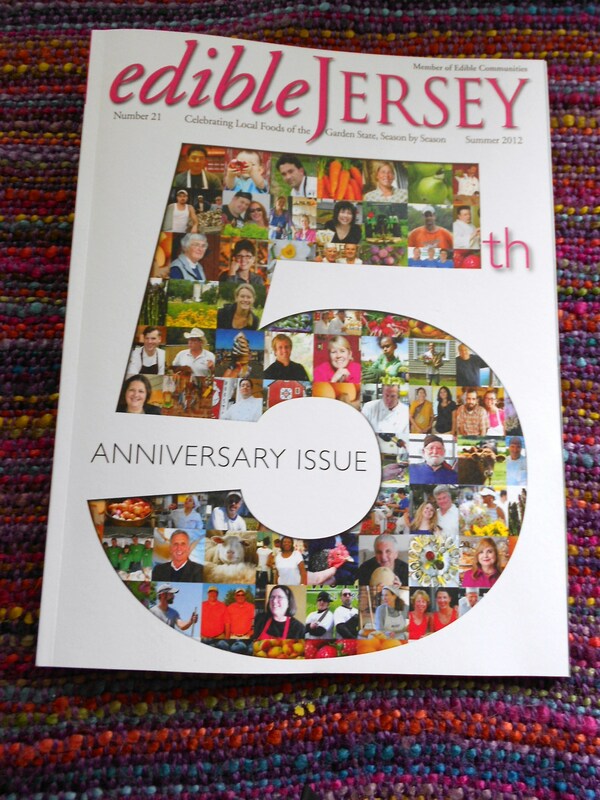 To help celebrate its fifth anniversary, Edible Jersey magazine is inaugurating this festival, for which more than 30 of the state’s top restaurants will celebrate farm-fresh ingredients with special seasonal menus at special prices, from June 23 to June 30. Among the offers: elements in Princeton is featuring a 3-course dinner for $39 and New Brunswick’s Frog & Peach has a prix fixe menu for $35. For the full list of restaurants, from A (A Toute Heure, Cranford) to V (Via 45, Red Bank) click here.